The British Army in recent years has been developing a program called The Future Rapid Effect System (FRES) which is a fleet of vehicles that can be rapidly deployed, network-enabled, capable of operating across the spectrum of operations, and protected against current threats. The FRES fleet is expected to comprise five families of vehicles. The first of these vehicles to have a secured future has been the Specialist Vehicle known as “Recce Block 1”. Its to include a reconnaissance (scout) vehicle and other roles such as repair. 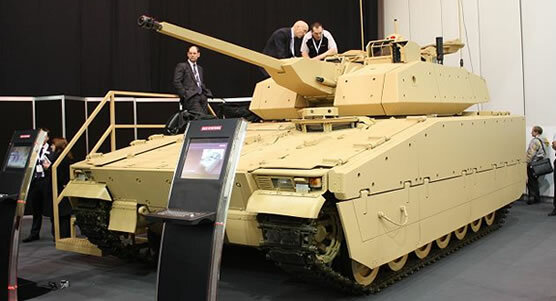 UK based Firm BAE, which owns many international military vehicle manufacturers, had entered its FRES SV in to the assessment-phase of the program. BAE had purchased the Swedish firm Land Systems Hägglunds AB in 2006. Hägglunds had developed in the mid to late 80’s a family of vehicles based on a common hull called the Stridsfordon 90 AKA the CV90, which became a very successful export vehicle during the 90’s for the company. With the acquisition of Hägglunds into the BAE family, it inherited a proven vehicle, which it could modify to meet the requirements of the British Army, which it did do. “Nearly half of the armoured reconnaissance vehicles are a Scout variant and the rest are repair, recovery and protected mobility variants. All will use the same chassis, referred to as a “common base platform.” A scout vehicle needs very high protection levels on the modern battlefield. BAE Systems’ combat-proven CV90 has made improvements in this area (and many others) with each of its six customers. We have fully met, and for certain threats, exceeded the MoD’s extremely challenging survivability requirements in mine blast trials. Trials commenced in 2004, culminating in a qualification test in 2008. Representative tests in 2009 have been successful against the FRES defined threats. Furthermore, Our FRES SV Scout chassis has been modified from the base vehicle, reducing its physical size and therefore weight to optimise it for the army’s reconnaissance role. This has further increased the weight growth margins existing for CV90 while maintaining total system size and weight, consistent with the FRES reconnaissance requirement. This evolutionary approach to meet changing threats means it is now the best-protected vehicle in its class, including mine protection comparable with a main battle tank – and yet it can be carried by an A400M. The BAE FRES SV included a new turret. British Forces engaging Taliban targets have found themselves having to bring down the mud walls the Taliban hide behind, using expensive hand held missiles to penetrate the walls, as the 30mm auto cannons cant penetrate them. So the BAE vehicle is equipped with a more penetrable 40mm auto cannon, as both the Scimitar (which FRES will replace) and the Warrior are serving in Afghanistan in the War on Terror. In March 2010 the MOD selected the GDLS UK’s design the ASCOD and awarded them the contract for the FRES SV.